Tiffany De Sousa Machado PhD/Master of Psychology (Health) candidate, Shool of Psychology, Faculty of Health and Medical Sciences at the University of Adelaide. 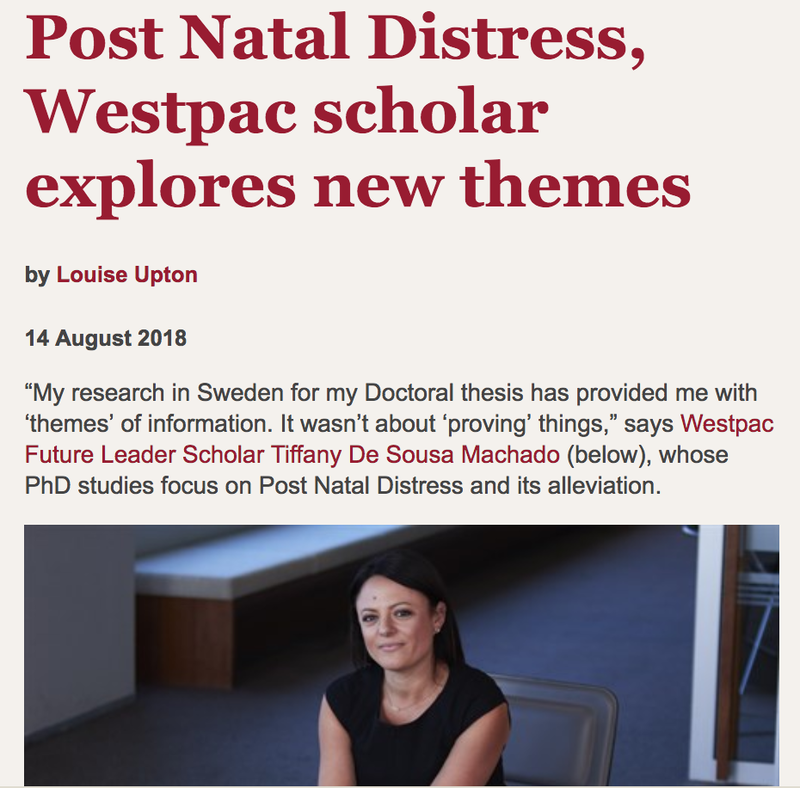 Tiffany wishes to share with the Psychology community further details about her research, and how she will be using the scholarship to contribute to community issues regarding post-natal depression. Women are bearing the brunt of a diagnosis that our culture needs to be more responsible for. Whilst not ignoring the biological changes which occur postpartum, I believe there needs to be a stronger focus on the cultural and social determinants. My goal is to reduce postnatal depression (PND) through increasing social connections and informing policy. I believe that by drawing on the strengths of other women this can be achieved. 16% of Australian women reportedly have PND. That’s about 1 in 7 mothers. This number is probably well understated as many women do not seek professional help, instead feeling shame and embarrassment over their perceived inability to cope and feel happiness over their new child. PND costs Australia approximately 300 million a year, with depression costing in excess of 12 billion. These two figures are related in so much as PND has the ability to affect all Australians – whilst directly influencing the mother and the other parent, siblings too can be affected. Infant development and bonding between parent and child are also at risk. This carries over into the community through workplace interactions, schooling, and social groups – the community is thus affected if the mother’s needs during postpartum are not effectively addressed. I aim to design a program which connects new mothers with older women on a personal level, drawing from their strengths and experience. push the boundaries of acceptable."